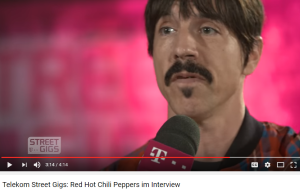 Telekom Street Gigs have released a new interview with Anthony Kiedis ahead of tonight’s special 360 degree RHCP show in Berlin, Germany. Presenter: Tonight there’s going to be a great, great show. It’s 360 degree live premier in Germany. It’s the first ever 360 degree live concert. So what do you expect? Anthony Kiedis: Umm, I try not to have too many expectations. I see you’re predicting greatness so I’ll try to fulfil that. So yeah, i’ll leave it wide open. Whatever happens, happens. It could be a disaster; it could be a catastrophe, it could be a meltdown, it could be a complete weird trip. You don’t know. You never know. We’ll start the party and see where it ends. That sounds great. You’re coming with a new album, The Getaway, and five years ago you brought us I’m With You, so what was the moment you said when shall we do the new record? Was there a special moment? Anthony Kiedis: Special moment? Umm… There were lots of little moments strung together. You know we go out on tour for a long time after we release these records and it’s pretty exhausting; fun and you know fascinating to go from one culture to the next when you are on tour. And sometimes it seems like a bit of a dream and in the end you need some time off. You need to go surfing, you need to go for a walk, you need to re-introduce yourself to your friends and see what home life is about. And time passes, and one day you’re like, ‘God, I’ve got a great idea for a song. I wonder what Flea’s doing?’ Or Josh will send out a group text saying, “Hey! Let’s play tomorrow.” And then you start the process over again. Presenter: There’s no plan I want to release an album in 2020, 2000… It’s just flow? Anthony Kiedis: We’re not that precise about our planning. We kind of let it take an organic shape. We just feel it on the inside like an internal clock and we go from there. Presenter: And you play right now, lots of gigs in Europe and you see so many places. Do you have the feeling that in different places the audiences are different? Do you say that in Germany people are like this in the audience, in France, in Great Britain… is there a difference? Anthony Kiedis: There are different personalities. You know it also depends on if you are playing a festival because in that case people are there to see all kinds of different bands so it’s a real melting pot of an audience but our audiences have been lovely no matter where we’ve been. Like we’ve just come from the Czech Republic and before that Hungary and people are good. And we feel very blessed to have that kind of greeting. You know, lively, soulful, warm, welcoming people. Presenter: You play lots of big arenas where you can’t see everyone in the back. Tomorrow [makes the correction], tonight it’s very, very close. Is there a difference if you can see all the faces? Anthony Kiedis: Umm… You try to see all the faces, obviously you can’t see the food caught in the teeth of the person in the back row, but I did get a lesson from the great George Clinton, when I was a much younger man. He said, ‘Definitely sing to the person in the last row because then it will bounce off all of the people until it gets there and then everybody will feel fed. You know, just don’t sing to the front row. You gotta get it to the back row.’ So whether it’s a large arena or a small place you gotta include everybody. Tomorrow it’s going to be very special because everybody is going to be able to be on stage with you with the 360 degree camera. Do you want to try it with a little warm up? Anthony Kiedis: [jokes]Don’t get too close! This entry was posted in Anthony Kiedis, New RHCP Album, Red Hot Chili Peppers, RHCP, RHCP Tour 2016. Bookmark the permalink.